Edward Pancratius Brehm. Courtesy of Raupp Memorial Museum, Buffalo Grove, Illinois. [S11] John J. Weidner, Compiled Birth, Death, 42, 665. [S49] Arlington Heights Herald, 18 Aug 1933, p. 2, col. 3. [S120] Arlington Heights Herald, 27 Jan 1949, sect. 1, p. 16 col. 3. [S157] Arlington Heights Herald, 14 Nov 1957, p. 16, col. 4. [S384] Letter, Victoria Brehm to John J. Weidner, 06 Aug 1997. [S540] Robert Q. Brehm, "Joseph Peter Brehm Family Group Sheet." [S1053] Elizabeth Schmit Brehm, State of Illinois; Department of Public Health - Division of Vital Statistics; Certificate of Death. [S11] John J. Weidner, Compiled Birth, Death, 39. [S162] Arlington Heights Herald, 07 May 1959, p. 15, col. 5, father not directly mentioned. [S162] Arlington Heights Herald, 07 May 1959, p. 15, col. 5, mother not directly mentioned. [S8] Edwin Weidner, The Weidner History, 74 birth year only. 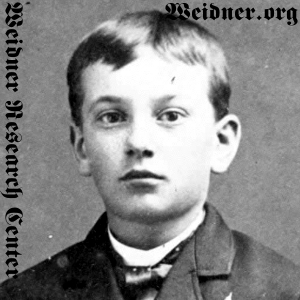 [S11] John J. Weidner, Compiled Birth, Death, 39 date only. [S162] Arlington Heights Herald, 07 May 1959, p. 15, col. 5, birthyear and location. [S11] John J. Weidner, Compiled Birth, Death, 27, 39. [S21] Cook County Herald, 16 Feb 1901, p. 4, col. 4. [S85] Arlington Heights Herald, 26 Feb 1943, sect. 1, p. 6, col. 2, Obituary has conflicting marriage date of 12 February 1900; no location. [S1053] Elizabeth Schmit Brehm, State of Illinois; Department of Public Health - Division of Vital Statistics; Certificate of Death, No marriage date or location. [S8] Edwin Weidner, The Weidner History, 74 death year only. [S162] Arlington Heights Herald, 07 May 1959, p. 15, col. 5, date and location. [S7] St. Mary Catholic Church, St. Mary's School Dedication, 136, listed as deceased. [S11] John J. Weidner, Compiled Birth, Death, 33. [S85] Arlington Heights Herald, 26 Feb 1943, sect. 1, p. 6, col. 2. [S162] Arlington Heights Herald, 07 May 1959, p. 15, col. 5. [S11] John J. Weidner, Compiled Birth, Death, 40. [S11] John J. Weidner, Compiled Birth, Death, 23. [S11] John J. Weidner, Compiled Birth, Death, 33, 665. [S11] John J. Weidner, Compiled Birth, Death, 42. [S192] Cook County Herald, 29 Mar 1918, p. 4, col. 3. [S405] The Cemetery Committee, Vernon Township Cemetery Inscriptions, Lake County, Illinois, 110.